Description: CEFX 113 leads empty grain hoppers east out of The Dalles. Description: A nice pair of Leasers *not Rent-A-Wrecks this time* go around the Foley Wye. Description: Waiting to back into the yard at Pigs Eye. Description: Backing into the Pigs Eye yard. 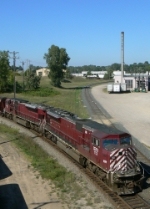 The second unit was STLH 5615. 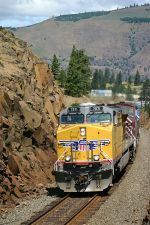 Description: The BNSF's Z-CHCPTL9 can be seen as a speck of light above the curving boxcars.